LOS ANGELES • It is a whole new world indeed. When Entertainment Weekly (EW) on Wednesday gave fans the first look of the cast of the upcoming movie Aladdin, few people probably expected the strong reactions to the look of the Genie, who will be played by Man In Black (1997) actor Will Smith. Several netizens wondered why the beloved Genie character was not blue in the live adaptation of the animated film, Aladdin. The Genie was voiced by the late actor Robin Williams in the 1992 movie. There were fans who also mocked the new Genie's high ponytail, comparing it to Goro, a character in the Mortal Kombat game series. Smith has gone on social media to reassure fans that his character will be blue in the completed movie. "This is how the Genie is in Human/Disguise form. My character will be CGI most of the movie," he wrote on Instagram. He said in the EW interview that he "started to feel confident that I could deliver something that was an homage to Robin Williams, but was musically different". He added that he tapped his past acting roles in the 1990s to shape the Genie in the new movie. Smith was famous for roles in the sitcom, The Fresh Prince Of Bel-Air (1990 to 1996), as well as movies such as Bad Boys (1995) and Independence Day (1996). EW also reported that the Genie's final version has not been completed, as the movie is slated to be released on May 24 next year. Director Guy Ritchie was quoted by EW as saying: "I wanted a muscular 1970s dad. He was big enough to feel like a force - not so muscular that he looked like he was counting his calories, but formidable enough to look like you knew when he was in the room." 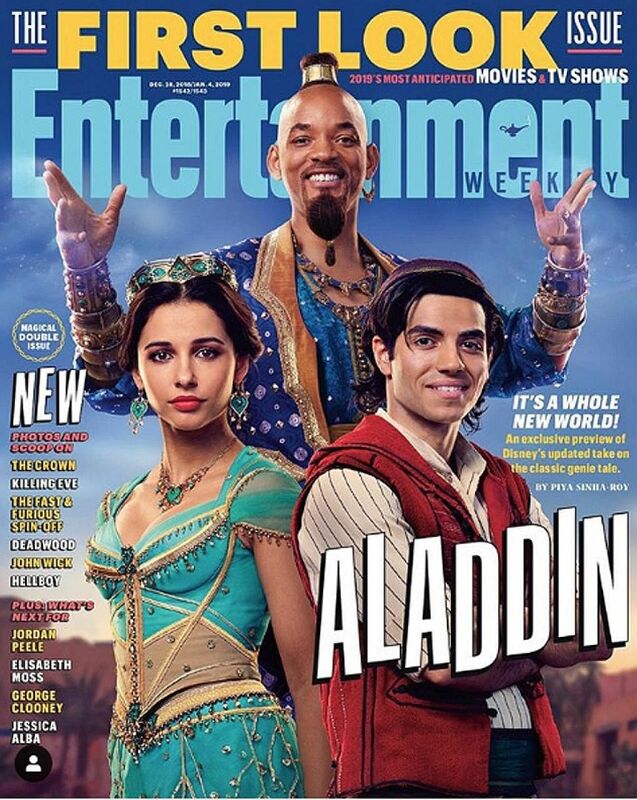 The EW cover also shows British actress Naomi Scott as Princess Jasmine and Canadian actor Mena Massoud as Aladdin. Scott is of Indian descent and is known for roles in the movies Power Rangers (2017) and the latest reboot of Charlie's Angels, due out late next year. Massoud recently appeared in the Amazon series, Tom Clancy's Jack Ryan, with actor John Krasinski, who played the titular role.